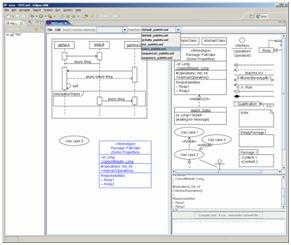 The free UML tool UMLet lets you draw UML diagrams with a light-weight, pop-up-free user interface. It lets you draw diagram sketches fast; export diagrams to pdf, eps, jpg, gif, svg, bmp, png, and system clipboard; share diagrams using Eclipse 3+; and create your own custom graphical elements. New in version 14.2: Fixed pixel displacements on export; improved relations; embeddable pdf fonts. By adding the following code below to your website you will be able to add an install button for UMLet - UML Tool for Fast UML Diagrams. I have a very low budget for software - open source all the way. I use UMLet for ALL my drawing needs. Any diagram explaining a process, idea, flow chart, whatever - UMLet. this is a really great app. Easy to use. Well done! What a great tool! Really efficient and easy to use! Umlet is really practical tool. ...for simplicity and power. After having used Rose, RSA, Visual Paradigm etc. I fell for Umlet. It is exactly what a programmer needs. Neither complex, nor lacking in capability. thank you very much very easy to use. Easy to use. Took me only a couple,of minutes to get the hang of how to construct diagrams. Recommended! This saved my life today when the UML app I paid for suddenly proved inadequete. But everything brightened back up again after a few minutes playing with umlet! Thanks!! One of the nicest new pieces of software I've used in a while. Totally straightforward, works smoothly, and the combination drag n' drop + text config interface is a GREAT IDEA. I used it stand-alone, and I bet the XML file format would be easy to parse for, eg, a custom code generator. How to change the order of elements? Explicit z-order control (useful for pdf exports of background-colored elements) will probably be included in v12.1; not yet in the upcoming v12.0. The UMLet authors don't seem to provide an update site. Dear UMLet authors, can you fix that? Pretty please with sugar on top. Its not clear how to install this plugin; Is the URL correct? On http://www.umlet.com/changes.htm you can see the change history, and download current and older versions of UMLet. I've been using UMLet for years, and will be using it for years to come. The "All in one" digrams help you explore ideas visually as if you are coding. As for complexity, there's always "just enough", and never "too much". From where i can download this plugin...? Spent ages trying to find the useful links on umlet website, the design of which gives me no confidence that the makers are competent to write a graphics tool. Dropped jar in plugins. Started eclipse. Created new umlet. Clicked on "pallet". kill -9 eclipse. Removed plugin. Unfortunately, we can't remove spam postings from the comments. Thankfully, Marketplace cleans the comments periodically. On http://www.umlet.com/changes.htm you can see the change history, and download current and older versions of UMLet. As UMLet evolves, sometimes we break file format conventions (we assume UMLet is used for throw-away sketches and pdf exports) -- so it might be useful to occasionally get an older version. I've been using UMLet for a day so far, and I am vastly impressed with it! It is an amazing piece of software and a joy to use, thanks for your outstanding job! Really easy to use and extend, great job! How do you install in indigo?? New to eclipse and the java world how do you install this plugin in eclipse? Tried 3 or 4 other UML tools. They were really hard to use. Finally settled on this. What a pleasure to operate. Very nice piece of software. Easy to use, responsive, ideal for quick UML diagrams without having any code generation baggage behind it. Excellent tool for UML. Used it for simple diagrams. Nice and intuitive use. Nice and simple tool. Integrates with Helios nicely. Export as feature works great and convenient. Iam unable to add the plain UMLet plugin to the eclipse, i did not understand whether it is added to the project as a jar file or as plugin to the eclipse if later is yes please explain me how to do it. It is a very nice program and it is very light to run on your computer. Many things that have taken ages is not a problem any more. It is not pretty easy to learn and after a short while you are almost on auto pilot. I don't know if it is just me or what, but typing CTRL-Z erases all the modifications made since the file was saved !!! I you don't save the file often you can loose all your work! Never type CTRL-Z. Edit: This seems to happen only when using "All In One" types of diagrams. Who knew? I've been trying to get several free UML tools (and several commercial evals, for that matter) to set up diagrams that got the point across (hey, isn't that the purpose of UML? ), but for whatever reason, the tools refused to do what I needed them to. Either that, or the controls are too 'smart' for their own good, rearranging elements or attaching connectors in some of the most AFU ways that I could've thought. UMLet is a great tool for setting up UML diagrams the way that you want. It's very simple to use, doesn't use 'advanced' layout algorithms that just get in the way of setting up your model, and doesn't presume to know (or care) about what you intend to do with the model once it's complete. One of the most gratifying features is that a label is a label. You would be surprised at the number of modelling tools (Papyrus builders, listen up) that let entities have a 'Name' property but hide the property in a property list instead of presenting it on the model, where you intended (and can see or print it...). I like the fact that it's extensible in a straightforward way, and that it doesn't appear to take itself too seriously. At work, I've been introduced to an extension of the UML use case diagram that includes UI mock-ups as a particular type of diagram element. I like the idea that I can set up such components in UMLet without having to build an entire rendering infrastructure to support their representation and use in a simple screen flow. I also like the stability of the product. Several other modelling tools appeared to have the right feature set, but tended to be crash-happy, ripping the guts out of the model just as it started looking fairly decent. These features were important to me, as I'm working on some fairly complex system interaction models that will be targeting assembly language (UML tool builders note: NOT JAVA), and this tool did me a favor by not trying to impose full OO/UML inflexibility on the diagrams that I was creating. It's more like it obeys the spirit of UML, rather than the letter of UML. And if you're not doing an elaborate cycle of code generation or round-trip engineering based on the model content (or can't, because the tool doesn't support the target language), this is exactly the right approach. Finally, I like the tool's portability. The tool I use at work, Sparx Enterprise Architect, is great in a lot of ways, but has some really neanderthal behaviors in unexpected places. In any event, EA is a Windows-only product (with a substantial licen$e cost), and I do my development on Linux (multi-core 64-bit, to be more precise). This is true of a lot of other 'advanced' commercial modelling tools, regrettably. Understandably, having a tool that runs on my platform of choice is a very important feature to me, and played a major part in selecting it for use in my personal projects. Well done to the UMLet team! I needed to make a nice UML component diagram for an impending meeting. I had a rough pencil sketch drawn in my notebook. I just wanted an SVG drawing representing my sketch, nothing heavyweight. I first tried using InkScape, but could not readily find any prepackaged UML symbols. I searched the web for UML diagrammers. Thank heavens that I found UMLet. I had a very detailed and impressive diagram drawn within an hour of downloading it. UMLet was very intuitive to use. UMLet seems to have minimal documentation. I was trying to find documentation on the markup language and then I saw a comment that one should learn from the markups made for the palette objects. Once I figured it out, I loved the flexibility of modifying relationship links with the "lt=" markup ... changing arrowheads ... changing annotations at each end. I absolutely prefer this "markup language" approach to object properties over other diagrammers' use of context menus. I still think that a UMLet markup language document is needed. Overall, I really like this UMLet tool and will be making heavy use of it. Kudos to the developers! Is there an Update site available? I'm trying to put the UMLet in my B3 aggregator, but it seems that there is only simple plug-in distribution. Are there any intentions to provide a P2 update site? I really like UMLet and am using it. I will probably introduce the rest of my development team to it but I will probably meet a little resistance for the following reasons. If anyone has any suggestions for addressing these issues, I'd really like to hear them. UMLet does UML pretty well. We need a little more functionality to make it really useful to the team. I know it's not called FLOWCHARTet or ERDIAGRAMet so don't spam me. I'm just trying to make this tool as useful as possible to my team. -Needs a basic flowchart palette. -Needs a database diagram palette. -Needs some documentation on how to create new objects. Creating custom objects from the menu is a little basic. I think if I could see the source for all the existing objects I could create what I need myself. If anyone can point me to that it would be very helpful. I want to express my thanks to the authors for creating a very agile tool! So simple there's virtually zero learning curve. Editing objects via the text window is really fast and much simpler that than the context menus and dialog boxes of traditional modelling tools. You'll be producing great quality diagrams in minutes. Highly recommended. That's just awkward. They should create an update site, so that this can be installed directly from within Eclipse. I appreciate the effort, but this tool does not satisfy my most basic expectations in a drawing tool. Even if it is only intended to be a simple drawing tool. It is very awkward to use. For example, try setting the name of the class. You can't just right-click on the class icon and enter the name. You have to mouse over to the Properties panel and enter the name there. That's my biggest beef with many free drawing tools. If you can't edit from the diagram itself, they are more trouble than they're worth. ERwin lets you do this and it truly makes me more productive. I think SmartDraw and Visio support this ability also. The second major weakness I noticed is that when you link two classes (e.g., parent/sub class) and then move one of the class icons on the diagram, the arrow does not follow to the new position. They're not linked. That is so basic to any diagramming tool, I just gave up at that point. I'm afraid good diagramming tools are complicated enough that we are going to have to bite the bullet and pay money to get a good one.